The fabulous Big Green Bookshop in Wood Green has been hosting a monthly mini local market for a few months, and we've planned to visit even though it is on a Sunday morning, and we are normally at Mass. However, we decided to skip Mass a week (shock horror) and pop down and support this super community effort. Egged on by some lovely tweeting from the shop's co-owner, we arrived to be greeted by a woman carrying samples of cookies & cakes. We decided these were delicious and worth coming back to after lunch. The delicate spicy sweet tangy scents from the next stall heralded the exciting Foxy Suriname cuisine - a choice of salt cod, chicken or Pom & chicken in a baguette with pickled cucumber. Pom is a root veg unique to Suriname, pounded into a kind of mash. 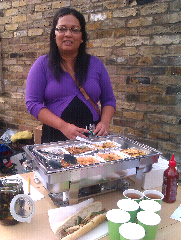 The photo shows the stall with the lovely cook. There were also cakes, cookies, bread, eggs, jams, quince preserves, local honey, knitted novelties and cross stitched gifts on sale. Oh, and books. It was a lovely morning, the Pom baguette filled me up even with my breastfeeding hunger, the people were lovely, and the kids even remained happy. If only it were on til later in the day, I'd be sure to go every month. Wauw I looked up your blog and saw your post about yesterday, and my food! Who knows, we'll see you again! Hi Jessica, thanks for reading my blog! Sorry about the pic, I wish I'd had my real camera, you are even much more beautiful in real life! Look forward to seeing you again and eating your food again some time!